So if I haven’t personally told you about this book face-to-face, consider this me doing you the same kindness. 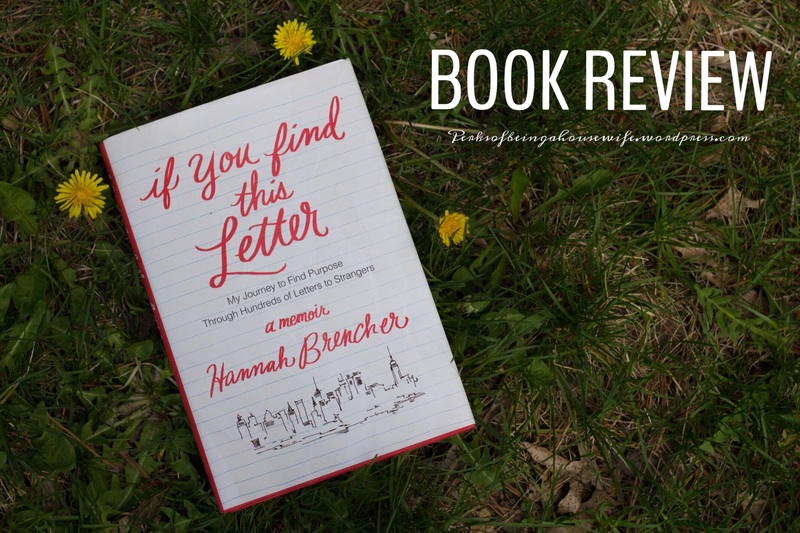 This memoir by Hannah Brencher is what I’m going to call Refreshing. I haven’t read a book quite like it in a long time, or really at all. I saw the recommendation for this book from a fellow person I follow on Instagram. The original intent was for this to be my beach read on our trip to Florida. Lesson learned: Vacations with 14 month olds don’t lend to much reading on the beach. So when I got a minute to begin this book on the drive BACK HOME I was instantly sucked right in. Hannah’s way in which she describes feelings, situations and conversations just made me want to be one of her friends. She has a passion for words that I can only compare to Beth Moore. Being that we are relatively the same age, it was really fun to actually get all the references and things she pulled from. I laughed. I cried. Short of books like Bible studies, I usually don’t underline things I read. Well I immediately felt the urge to grab a pen and underline all her quirky ways to explain things. Most were of her describing how she had felt, which were always so spot on and made me silently shout “yes!” as I was reading. What I loved most about this book was how she found herself doing something so simple, yet so profound for others. In the process she also found God which was so exciting to see unfold. A story like this, I feel, can only be a result of getting to know the heartbeat of our Jesus. She took her passion for writing letters (handwritten) and turned it into a way to be a light for others. In this crazy all-about-me world, I would say this inspired me so much to start thinking outside of myself. Her journey of just simply writing one letter to make her not feel so lonely soon blew up into something Bigger than herself. Don’t we all crave that? Not just to walk through life with the feeling of inadequacies or being too little, quiet, shy, unworthy, scared, busy, broke, uneducated, uncool, not popular, or not smart enough to do something that will make an impact. Without giving more of the book away, I will end it by saying this….READ THIS BOOK. It’s worth it. Get out that old dusty library card and head on down to your local library to find a copy. Borrow mine if you’d like. Get it for your Kindle or iPad. I promise it’ll keep you wanting to know what happens. I love that because it’s a memoir the events of this book ACTUALLY happened. I love nothing more than to know where someone has walked and how it shaped their lives forever. My prayer is that this book would inspire others to reach out, as uncomfortable as it is sometimes, and really be intentional about telling others just how dearly loved they are. For you reading this, if no one else has told you lately- YOU ARE WORTH IT. YOU MATTER. YOUR SWEET SOUL HAS A PURPOSE & A PLAN IN THESE DAYS HERE & NOW. YOU ARE LOVED. *This review is strictly my own opinion and I was not paid to share my findings. With that said, check out the website MoreLoveLetters.com if you’d like to learn more or see how you too can impact some lives. Also let us know in the comments below if you’ve read this book yourself and what you thought about it.